Zhe Chen, PhD, is currently a Research Fellow in the Neuroscience Statistics Research Laboratory at Harvard Medical School. Simon Haykin, PhD, DSc, is a Distinguished University Professor in the Department of Electrical and Computer Engineering at McMaster University, Ontario, Canada. Jos J. Eggermont, PhD, is a Professor in the Departments of Physiology & Biophysics and Psychology at the University of Calgary, Alberta, Canada. Suzanna Becker, PhD, is a Professor in the Department of Psychology, Neuroscience, and Behavior at McMaster University, Ontario, Canada. 1.2 Correlation Detection in Single Neurons. 1.3 Correlation in Ensembles of Neurons: Synchrony and Population Coding. 1.4 Correlation is the Basis of Novelty Detection and Learning. 1.5 Correlation in Sensory Systems: Coding, Perception, and Development. 1.6 Correlation in Memory Systems. 1.7 Correlation in Sensory-Motor Learning. 1.8 Correlation, Feature Binding, and Attention. 1.9 Correlation and Cortical Map Changes after Peripheral Lesions and Brain Stimulation. 2. Correlation in Signal Processing. 2.1 Correlation and Spectrum Analysis. 2.1.6 Higher Order Correlation-based Bispectra Analysis. 2.1.7 Higher Order Functions of Time, Frequency, Lag, and Doppler. 2.1.8 Spectrum Analysis of Random Point Process. 2.6 Higher Order Correlation-Based Filtering. 2.7.2 Correlation Filter for Spatial Target Detection. 2.8 Correlation Method for Time-Delay Estimation. 2.9.4 Fisher Linear Discriminant Analysis. 2.9.5 Common Spatial Pattern Analysis. Appendix: Eigenanalysis of Autocorrelation Function of Nonstationary Process. Appendix: Estimation of the Intensity and Correlation Functions of Stationary Random Point Process. Appendix: Derivation of Learning Rules with Quasi-Newton Method. 3. Correlation-Based Neural Learning and Machine Learning. 3.1 Correlation as a Mathematical Basis for Learning. 3.1.1 Hebbian and Anti-Hebbian Rules (Revisited). 3.1.3 Grossberg’s Gated Steepest Descent. 3.1.6 Local PCA Learning Rule. 3.1.7 Generalizations of PCA Learning. 3.1.9 Wake-Sleep Learning Rule for Factor Analysis. 3.1.11 Perceptron Rule and Error-Correcting Learning Rule. 3.1.12 Differential Hebbian Rule and Temporal Hebbian Learning. 3.1.13 Temporal Difference and Reinforcement Learning. 3.1.14 General Correlative Learning and Potential Function. 3.2.1 Mutual Information vs. Correlation. 3.2.3 Hebbian Learning and Maximum Entropy. 3.3 Correlation-Based Computational Neural Models. 3.3.6 Neuronal Synchrony and Binding. 3.3.9 Correlations in the Olfactory System. 3.3.10 Correlations in the Visual System. 3.3.12 CMAC and Motor Learning. Appendix: Mathematical Analysis of Hebbian Learning. Appendix: Necessity and Convergence of Anti-Hebbian Learning. Appendix: Link Between the Hebbian Rule and Gradient Descent. Appendix: Reconstruction Error in Linear and Quadratic PCA. 4.2 Kernel PCA and Kernelized GHA. 4.3 Kernel CCA and Kernel ICA. 4.7 Kernel-Based Correlation Analysis: Generalized Correlation Function and Correntropy. 5. 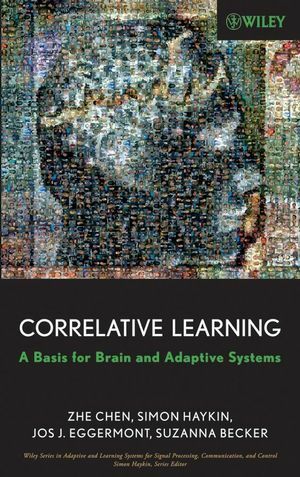 Correlative Learning in a Complex-Valued Domain. 5.2 Complex-Valued Extensions of Correlation-Based Learning. 5.3 Kernel Methods for Complex-Valued Data. 5.3.1 Reproducing Kernels in the Complex Domain. 6. ALOPEX: A Correlation-Based Learning Paradigm. 6.2 The Basic ALOPEX Rule. 6.3 Variants of the ALOPEX Algorithm. 6.3.1 Unnikrishnan and Venugopal’s ALOPEX. 6.3.3 An Improved Version of the ALOPEX-B. 6.3.5 Other Types of Correlation Mechanisms. 6.5 Monte Carlo Sampling-Based ALOPEX Algorithms. 6.5.1 Sequential Monte Carlo Estimation. Appendix: Asymptotical Analysis of the ALOPEX Process. Appendix: Asymptotic Convergence Analysis of the 2t-ALOPEX Algorithm. 7.1 Hebbian Competition as the Basis for Cortical Map Reorganization? 7.2 Learning Neurocompensator: A Model-Based Hearing Compensation Strategy. 7.2.2 Model-Based Hearing Compensation Strategy. 7.3 Online Training of Artificial Neural Networks. 7.3.3 Online Option Prices Prediction. 7.4 Kalman Filtering in Computational Neural Modeling. 7.4.2 Overview of Kalman Filter in Modeling Brain Functions. 7.4.3 Kalman Filter for Learning Shape and Motion from Image Sequences. 7.4.4 General Remarks and Implications. 8.1.1 Hebbian Plasticity and the Correlative Brain. 8.2.1 Generalizing the Correlation Measure. 8.2.2 Deciphering the Correlative Brain. Appendix A: Autocorrelation and Cross-correlation Functions. Appendix C: A Primer on Linear Algebra. Appendix D: Probability Density and Entropy Estimators.